The source of greenhouse gases varies by both country and the type of activity. In general, countries that have a higher level of economic development tend to have higher energy use, which in most countries means they burn more fossil fuels. 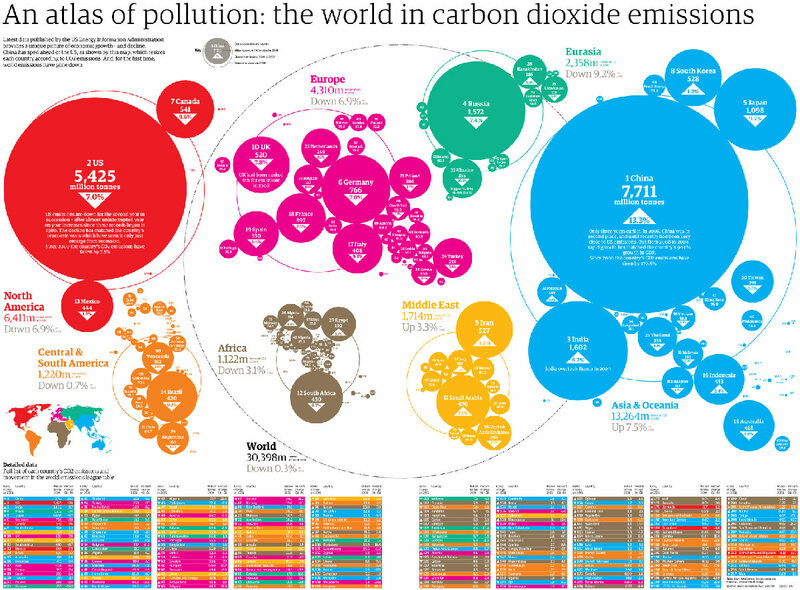 The graphic below shows the 2009 data for emissions by country. It’s clear that the more economically developed countries of Europe, North America and Asia have higher levels of emissions than the relatively less economically developed areas of South America and Africa. However, there is not a simple relationship between economy and emissions. In High Income Countries (HICs), energy requirements are high because of domestic consumption as well as industry. However, HICs often have strict environmental laws and are switching to relatively expensive new technologies to produce renewable energy with no or few emissions. This is demonstrated by the graphic below, showing that richer countries can reduce emissions while enhancing their economy (Aden, 2016). In Middle Income Countries (MICs) that have emerging manufacturing industries, industrial energy use is very high, while domestic consumption is lower. Many MICs that are industrialising burn large amounts of fossil fuel because the technology is inexpensive and widely available. Even so, some MICs such as China are strongly promoting renewable energy sources. In Low Income Countries (LICs), emissions are generally low as there are few industries and also a smaller demand for domestic consumption. When the per capita income is low, there is less money for products that use energy such as air conditioners. Reduction in emissions with economic growth. Source: Aden, 2016. The graphic below shows the world’s top ten greenhouse gas emitters in 2015. The interactive version on the original website allows you to check exact figures and is well worth a look. The overall spread of the top ten, which contains a mixture of HICs (USA and the countries of the European Union) and MICs, reinforces this complex picture. Emissions by country and activity. The interactive version on the original website allows you to check exact figures and is well worth a look! Note that the European Union is considered as one territory. Source: Friedrich, 2015. The growth in these gas emissions over time shows that although the amount from HICs is roughly stable, it is the industrialising regions of the world – especially Asia, led by China and India – that are now producing the most emissions. The two graphs below show the cumulative share of emission and economy and demonstrate the link between the two. World carbon dioxide emissions by region. Note: ‘Reference case’ refers to the methodology by which the data was calculated. Energy Information Administration, n.d.
World GDP PPP by region. Note: ‘Reference case’ refers to the methodology by which the data was calculated. Energy Information Administration, n.d. The benefit of looking at total emissions by country is that it shows where the political power lies in terms of making big changes. By looking at the graphs above, it is clear that China, USA and OECD European countries make up the biggest share of the emissions. If those countries change their emissions levels it will have a big impact on total emissions. However, looking at the levels of emissions by country and region can be misleading. For example, it’s natural that China has high levels of emissions because the population of China is so large. By switching to look at ‘per capita’ emissions, it is clearer to see which countries have the most unsustainable levels of emissions. The image below shows the ‘carbon footprint’ in graphic form; the left foot is for total emissions and the right foot shows per capita emissions. It is very clear that small states – especially island nations – have people with the individual lifestyles that lead to high emissions. Carbon emissions by nation and by per capita values. Source: Standford Kay Studio, 2007. This complex picture of the sources of emissions and the countries responsible for them can be explained by the impact of economic development, globalization and world trade. Countries that are more economically developed have high levels of resource consumption, including energy. As countries become more economically developed, their emissions will therefore increase. The increasing interconnectedness of the world – ‘globalization’ – has helped many economies to increase. One aspect of this is world trade: countries that trade more tend to be countries with high emissions either because they have a lot of manufacturing industries, or because they have a high consumption of resources. This can include ‘hidden’ or ‘embedded’ emissions. Hidden emissions are those emissions that are physically released in one country at the point of manufacturing a product. For example, Apple makes its iPhones in China, where greenhouse gases are released. But the product is then sold to another country, which is therefore ‘responsible’ for the emissions. This is because the product would not be produced if it weren’t for the demand from the destination country. This is why some people consider the higher income countries to have even more responsibility than the figures shown on this page. Energy Information Administration, n.d. World carbon dioxide emissions by region. Via https://rainforests.mongabay.com/09-carbon_emissions.htm Accessed 2 February 2018. EPA [Environmental Protection Agency], 2014. Climate Change Indicators: Global Greenhouse Gas Emissions. https://www.epa.gov/climate-indicators/climate-change-indicators-global-greenhouse-gas-emissions Accessed 2 February 2018. Friedrich, 2015. Infographic: What Do Your Country’s Emissions Look Like? http://www.wri.org/blog/2015/06/infographic-what-do-your-countrys-emissions-look Accessed 2 February 2018. Standford Kay Studio, 2007. Carbon emissions by nation and by per capita values. http://stanfordkaystudio.com/ via http://rebrn.com/re/carbon-footprint-total-emissions-per-nation-598038/ Hi-res version available at https://conversations.marketing-partners.com/wp-content/uploads/2012/08/mmw_co2footprints_111510.jpg Accessed 2 February 2018. Describe the global distribution of greenhouse gas emissions. Tip: This question is asking about the spread of emissions across the world. Describe the changes in emissions by region between 1990 and 2012 according to the graph below. Tip: This question is asking about the changes in emissions in different regions over time, so you should mention things such as ‘increasing’ ‘decreasing’ ‘sharp rise’ etc. Climate Change Indicators: Global Greenhouse Gas Emissions. Source: EPA, 2014. Write a script for the voiceover of a two minute revision video about the variation in greenhouse gas emissions. Include all the graphics from this page as the visuals that will appear on screen and put them into a slide show that you then narrate. Work in pairs to provide feedback on each other’s commentary, and remember to comment on whether the structure of the talk makes sense. https://www.eia.gov/outlooks/ieo/pdf/0484(2017).pdf which outlines the existing and future trends in energy including emissions. Which specific aspects of energy production are driving the increase in emissions? © Matthew Burdett, 2019. All rights reserved.